Installing more memory in your computer is one of the easiest ways to improve the performance and speed of your computer. However, it is important to buy the right type of memory. There are several computer brands on the market so it is not surprising that there are several brands of memory. Even within a given brand there are things to watch out for. Computers are individuals when it comes to replacing memory, there is no one-size-fits-all involved. The first thing you need to do is find out what kind of memory your computer can run. Computers can be limited to certain amounts, speeds, and manufacturers. If you buy the wrong kind of memory module it will not work in your computer. Your computer manual should tell you what type and size of memory you already have installed. If you no longer have the computer Manual then you can turn off the power and open the tower to look at the memory module already there. Before touching anything inside the tower of your computer, first touch the metal frame to disperse any static. Remove the clips on the memory if there are any, and then gently press the tabs on both end of the memory module to release it. Do not touch the connectors’ across the bottom of the module. Carefully lift the module out and there should be a label on it telling you what kind of memory it is and the amount and speed. While you have the tower open check for dust and blow it out with canned air. The label should read something like 128MB PC 3200 400MGz DIMM it may not say exactly that but it should be similar. While you have the tower open check and see how many slots you have for memory modules. These would be slots just like the one you removed the memory from. Normally they will be right next to each other. Write down what is on the label then gently replace it in the slot, making sure that the small bump in the bottom of the memory slot lines up with the groove in the memory module. As you press down gently on both sides the tabs should click back into place, and then just replace the clips and power back up. You now have the information you need to order more memory and you know how to install it. 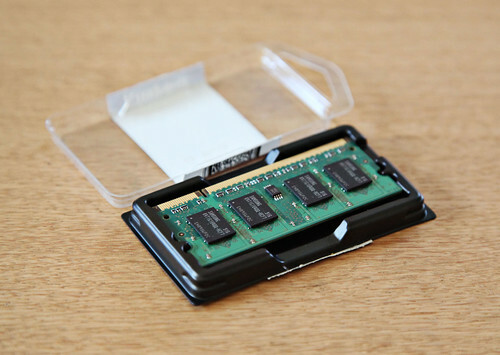 You can either order the new memory module online or at your local computer store. Keep in mind that if you have two slots for memory and want to go from 128MB to 256MB then you need to order one 128MB module.